In the world of Diaclone, there are two big toys that most people know of, even if they sometimes get them confused. One is Great Robot Base, and the other is Robot Fortress X. 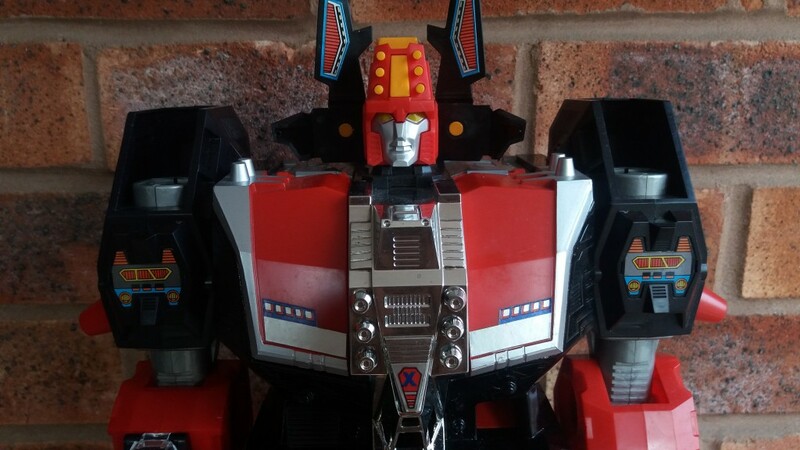 Great Robot Base is probably the better known of the two, as his head is used on some of the Diaclone logos, including on the new Diaclone Revival line, and because he is frankly, bloody massive, second only to Fortress Maximus in the 1980’s Takara scale. 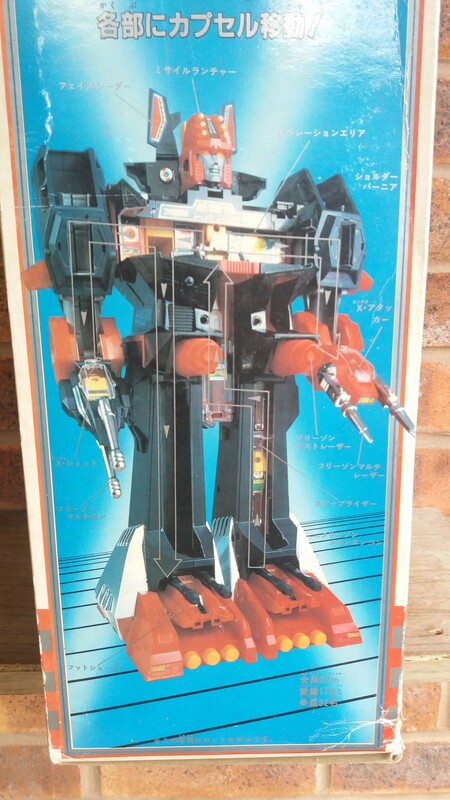 Going in to Botcon 2016, I was interested in picking this guy up, and while there were some very good boxed and loose examples for sale, the prices were quite high and there were about six or so in the room. Over the whole weekend, I only saw one Robot Fortress X. Which I bought. 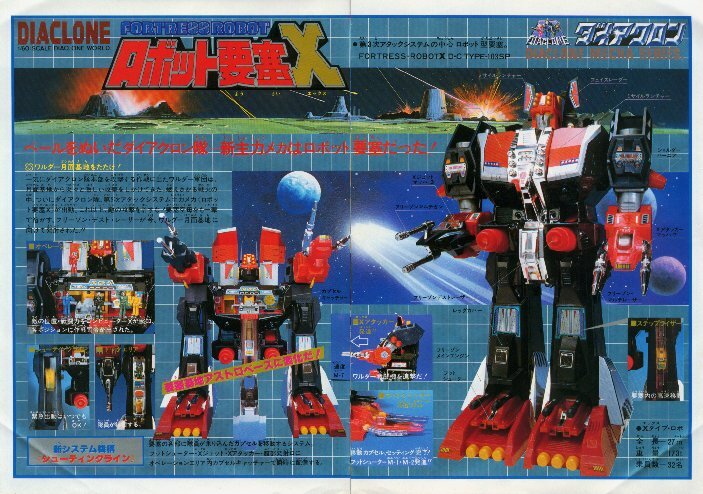 Which is why today, we’re taking a look at an original 1980 vintage Takara Diaclone Robot Fortress X. Okay, the box isn’t in great shape, but then again it is only one year younger than me, and arguably I am in worse shape. The window is cracked, and the entire top flap has separated from the box, but it still displays well and I’m very happy with the great box art. Photoshop has a lot to answer for, I miss packaging that looks like this. 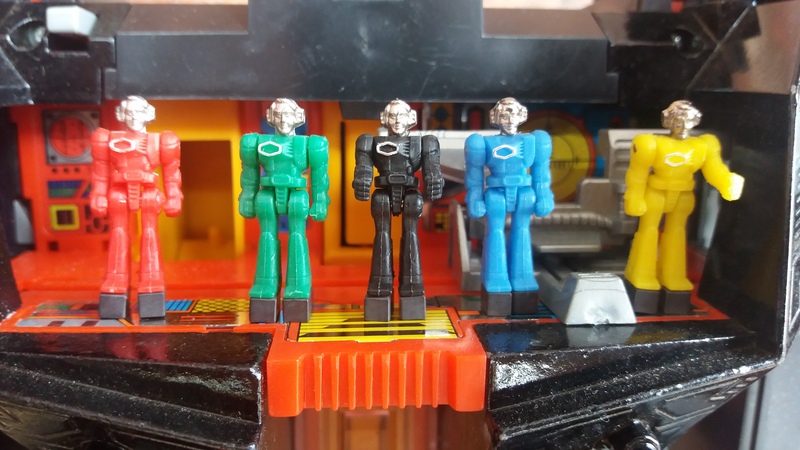 Out of the packet, the first thing we’ll look at are the Diaclone Drivers, 5 of them, all with die-cast heads with incredible detail, and magnets on the feet, which help to keep them in position when they’re displayed in and around Robot Fortress X, or any of the other Diaclone toys. These are surprisingly heavy, and I can tell straight away that the Diaclone driver I got package with my Diakron Red Sunstreaker a couple of years back is a fake. These are not! Lets jump to base mode next, so we can see some of that Diaclone driver interaction. You’ll notice that while the box isn’t in the best condition, the toy is ABSOLUTELY STUNNING! Yes, I am excited about this one. Sue me. The base mode keeps on giving, with plenty of hidden interactions, to the point that I’m not sure I’ve discovered them all. Below we see a shot of the Drivers all hanging out in his chest section, that slightly chrome looking sticker sheet they’re standing on is actually magnetised, holding them nicely in place. To start with, the little tanks in the feet shoot out when you press a little button on the back. Great fun! And with some force too! The gun turrets are fun for driver interaction, and I’m sure most people will be able to see similarities between the little cockpits and a certain trailer for a certain Autobot leader. Having had zero experience with this toy, I couldn’t help thinking there was more to the base than meets the eye I was discovering, and sure enough, there is! Some bits I’d left in the box for safe-keeping. You take these little pods (which you can pop a Diaclone driver in) and you can maneuver them all over Fortress X’s body using a system of elevators and release catches. You can drop them into his shoulders and they’ll pop into his hand cockpits, or reverse them into the leg using the tank and raise them all the way up into the chest section, around, and back down the other leg. It’s an amazingly cool – if totally pointless – play-feature, one which I’m sure as a kid I would have got huge amounts of fun out of, and something that would be near impossible to replicate in a modern rendition of third party toy, because of the amount of articulation we have in modern toys. It’s a hard system to describe, thankfully, the lovely original advert for this bad-boy shows it pretty well. If you watched the above video, you’ll have noticed this guy doesn’t really transform. At all. He sort of parts form, if you can call pulling off his legs and sticking them elsewhere. Still, the way the chest opens up is cool, and the shin panels pop off so you can watch the pods zip about, so he sort of looks different I guess. The face just opens up, and the arms don’t even need the amount of movement they show in the video, they just fold down. Look at this guys face!!! It’s beautiful. As an add bonus, look at the reflection?!? How nice is this chrome? Funny story; I’m not sure what they used to put in chrome back in the eighties so it ages better than Beast Wars chrome, but whatever it is, it triggers all sorts of warnings from the TSA. Whilst passing through security Stateside, I took this guy in my carry on luggage to protect the box (I always put modern stuff in my main suitcase), well something on the security X-ray didn’t scan right, and they pulled the suitcase, turfed out all the clothes I’d used to pad the case, and pulled this guy out of the box right in front of me, leading me to very politely ask them to be careful with the box because it’s thirty years old and worth a fair bit of money. The woman was very understanding and let me repack it, after she’d swabbed the chrome and put it in for analysis. The good news is; Robot Fortress X has not been handling explosives before we got on the flight! Phew! 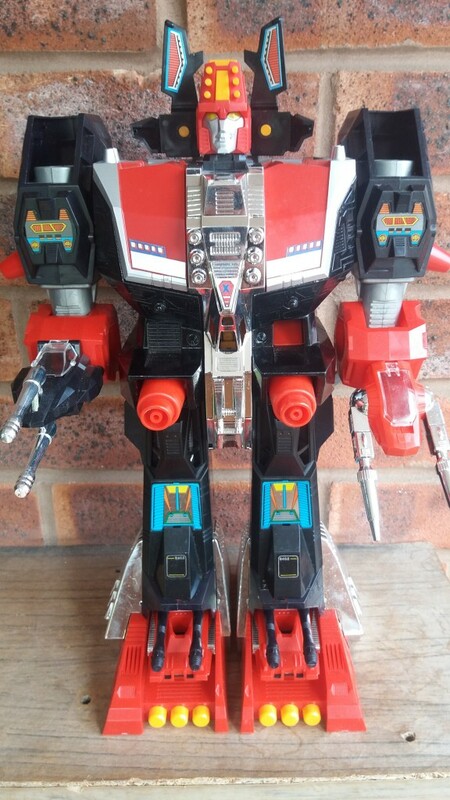 In robot mode, I think he looks stunning. Just all sorts of awesomeness in his design, and I just want to pick it up and fiddle about with it. 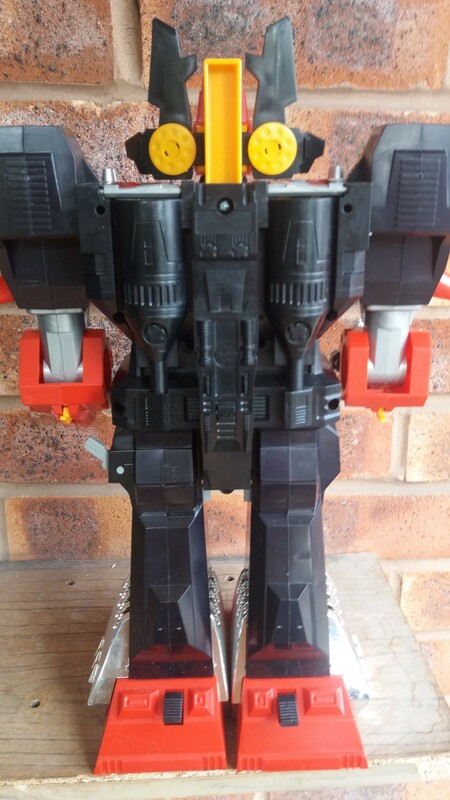 To help give you guys an idea of scale, he is a tiny bit bigger than G1 Scorponok. Here’s a picture of the back of him, just because you never see this shot and there is so much detailing. 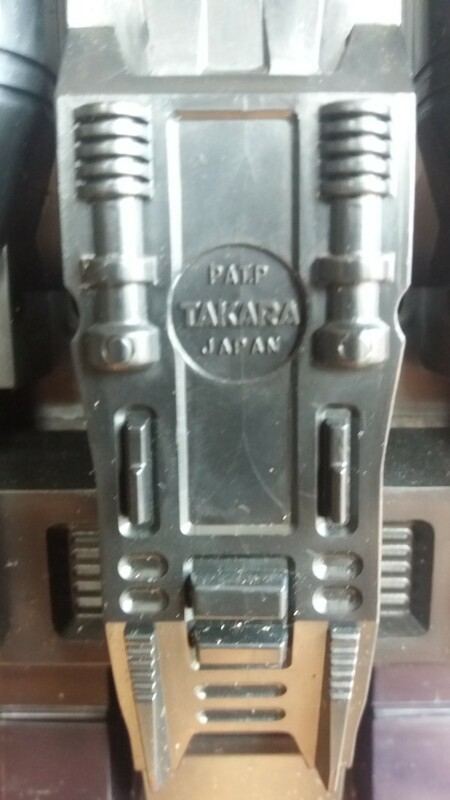 The care and attention to detailing over every square inch is second to none, no corners cut; this was clearly a labour of love for the designer, backed fully by Takara. Check out the detailing on the chest panels, and that cute little factory applied “X” on the chrome. Overall, I absolutely adore this figure. I think most people know I’ve been on a vintage kick the last five years or so, and this guy doesn’t disappoint. 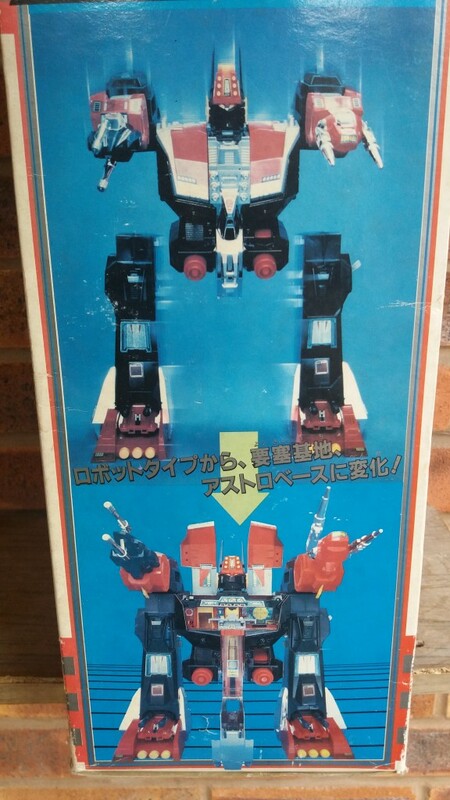 It’s so rare for me to pick up a vintageTransformers toy these days where I have had zero experience of the mold, so this piece of Takara history is a real treat for me. It’s big, impressive, heavy thanks to LOTS of die-cast, shiny, and very fun. Sure, it doesn’t really fit in with Transformers at all, and even the Autobot Mini-cars would struggle to interact with this playset, so I can totally see why Hasbro rejected this one for the line during it’s infancy, as it doesn’t really fit in with the play pattern of G1 toys at all (even partsforming master Omega Supreme has distinctly different forms). However, I view this as one of the vital pieces of the puzzle on the way towards Metroplex, which would later lead us to Fortress Maximus. Although, this piece does make me think Hasbro missed a trick by not retooling / redesigning a Diaclone Driver into Spike or Sparkplug back in the day, I know as a kid my brother and I really wanted small figures to fit in the vehicles and Dinobots, even if I was completely unaware of the Diaclone origins. 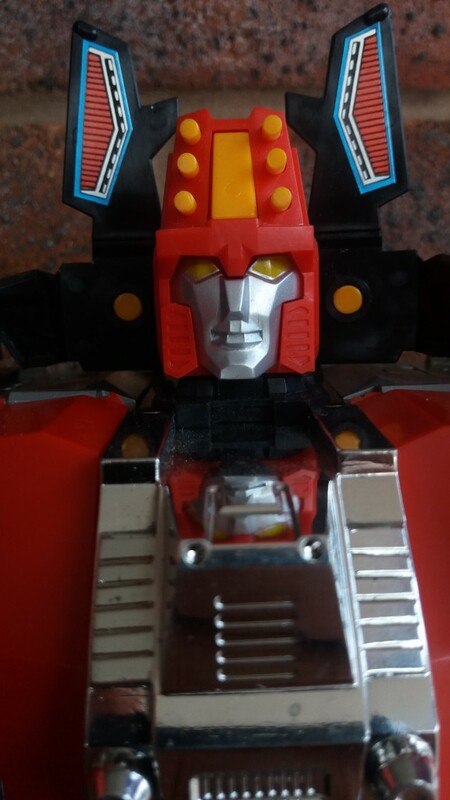 He’s an expensive toy these days, and he doesn’t show up in great condition often, but a bit of patience and willingness to haggle saw me get this on the Sunday of Botcon, for HALF of the price the dealer was asking on the Friday afternoon. Bargains can happen. 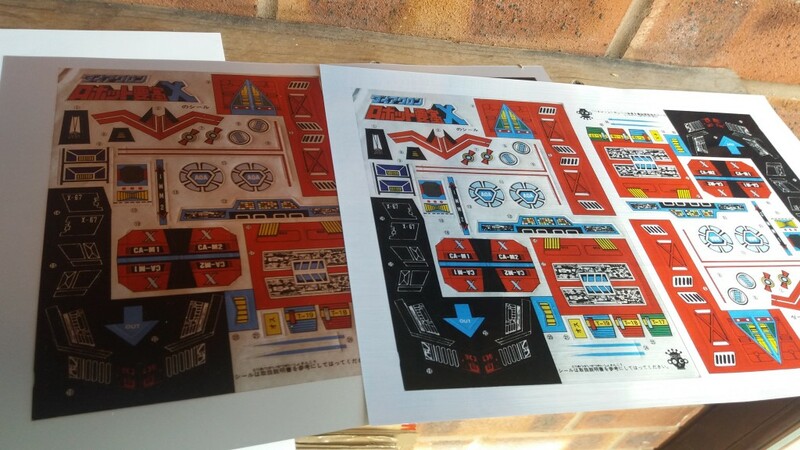 Unfortunately, this guy didn’t come with any of his paperwork (I would love a genuine Diaclone catalogue), so no instructions and no stickers, however, it did come with four sheets of uncut reproduction sticker sheets, so I might fire one over to the guys at Toyhax if they need it. I’ll probably never put them on, but it is very tempting to do so as stickers from back in the day were awesome, and the pods especially are desperately bare without them. You can pre-order the new series of Diaclone Diabattles from Kapow Toys right here, or you might prefer a Diaclone flavour with a G1 repaint scheme courtesy of Fans Project’s Warbot Dai-Z. I’ve ordered both, because I’m insanely excited for Diaclone Revival (with a real mixed feelings about whether they might do reissues), and I’m always down for more Warbots from FP! Finally, I’ll leave you with a shot of the boxes art, just for fun, and a copyright shot, because some people love that stuff. 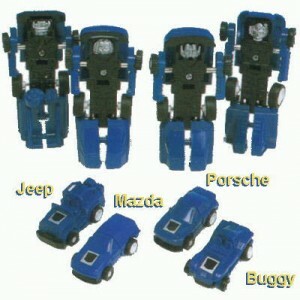 These curious little fellows are an oddity in Transformers, as they’ve never been packaged to buy individually. 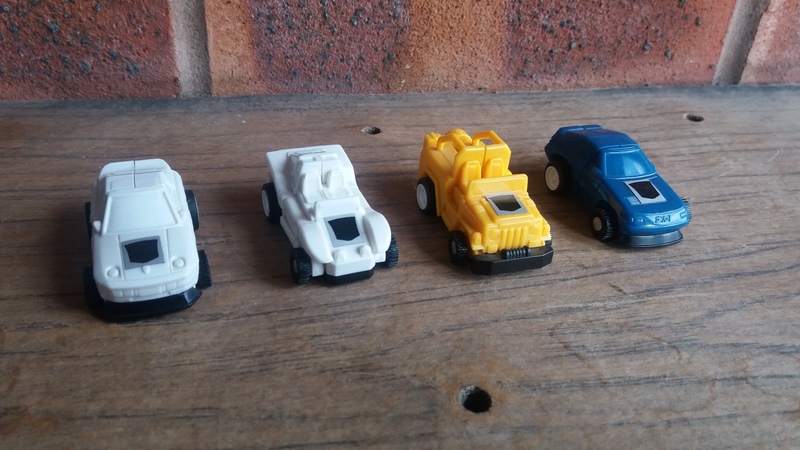 Instead, the mini-spies were given away “free” in 1985, packaged with the Autobot mini-cars to introduce the new concept of heat activated rubsigns, so you could see which faction a character belonged to! 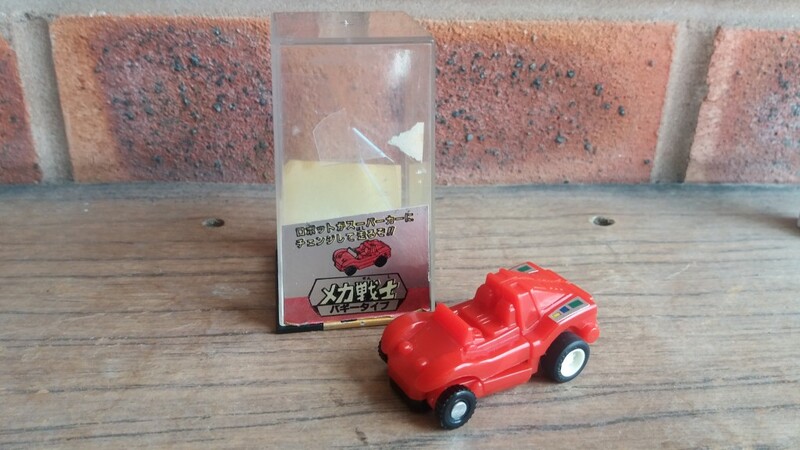 Not like it was ever a big secret before mini-spies, with Transformers items branded with the appropriate faction logo right on the front of the packaging. The real reason for the new rubsigns was slightly more insidious. Unsold stock from licensing deals (most notably Diakron) that pre-existed the Hasbro / Takara alliance were showing up for sale with the popularity of the Transformers cartoons, and Hasbro wanted to make it very clear to parents and children what a REAL Transformer was, with the instructions from 1985-1987 stating that only a REAL Transformer has the rubsign as a seal of authenticity – after all, Hasbro saw no money from these other toys. 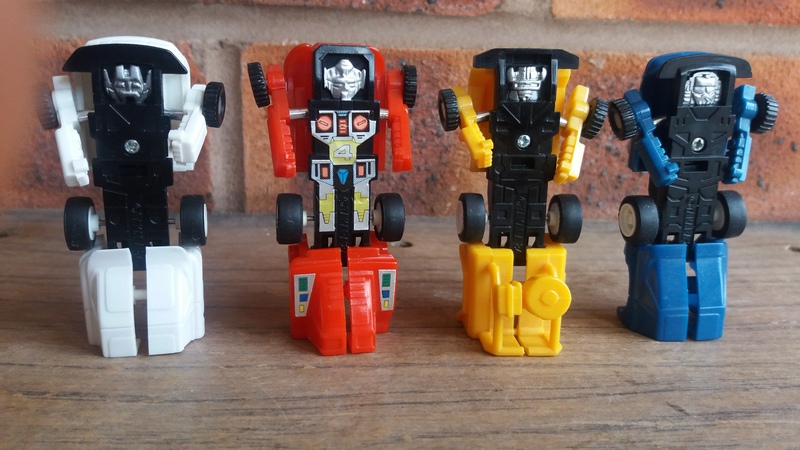 It also helped to distinguish Transformers from their rival GoBots, because to many a parent, a transforming toy robot was a transforming toy robot. 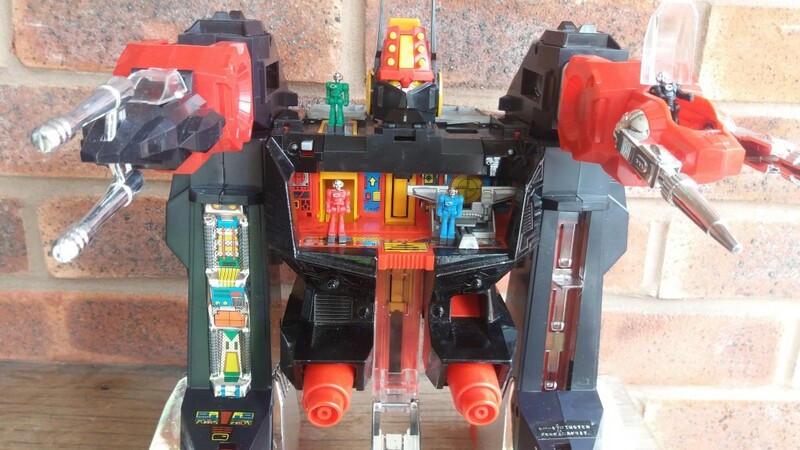 Of course, children and parents back then couldn’t have known the intricacies of trade deals, or predict the rarity of the pre-rub toys, or even moreso the mythical unsold Diaclone / Microchange toys cluttering up clearance aisles with their weird colouring variations. 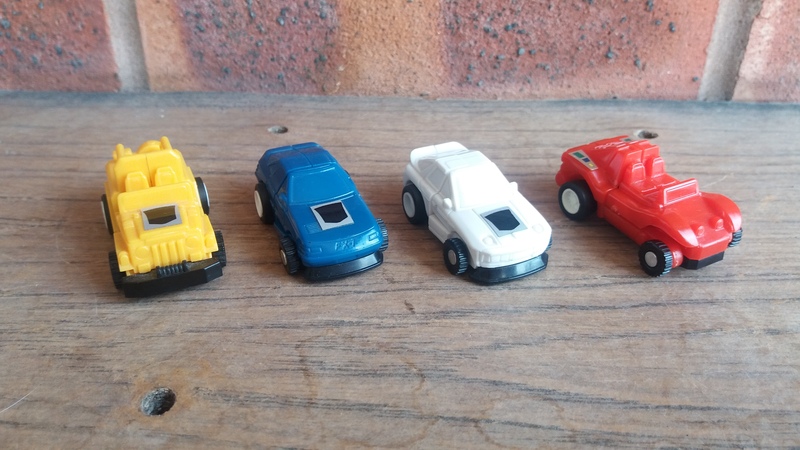 The Mini-spies were never named individually, but were available in four different body types; Jeep 4WD, Buggy, Toyota FX1 Concept, and Porsche 928, and in three different colours; White, Blue, and Yellow. That means a Transformers collector with OCD has no good way of displaying four different minispies, as two of the colours will repeat. This has never sat well with me. 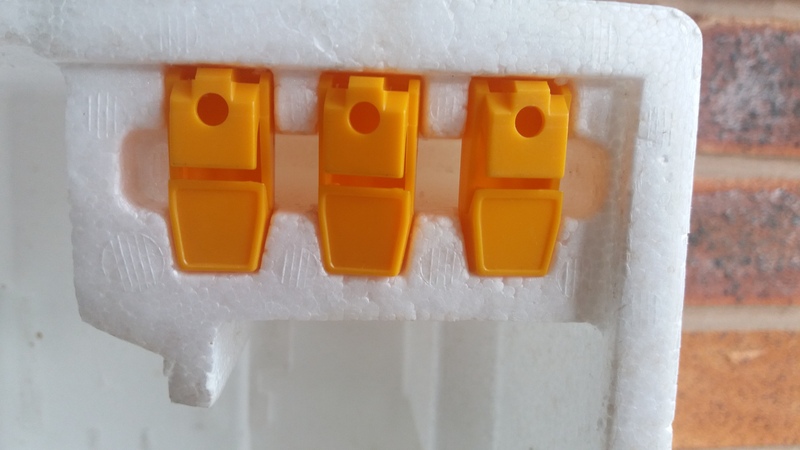 One solution is to collect each mold in each colour, for a total of 12 variations. 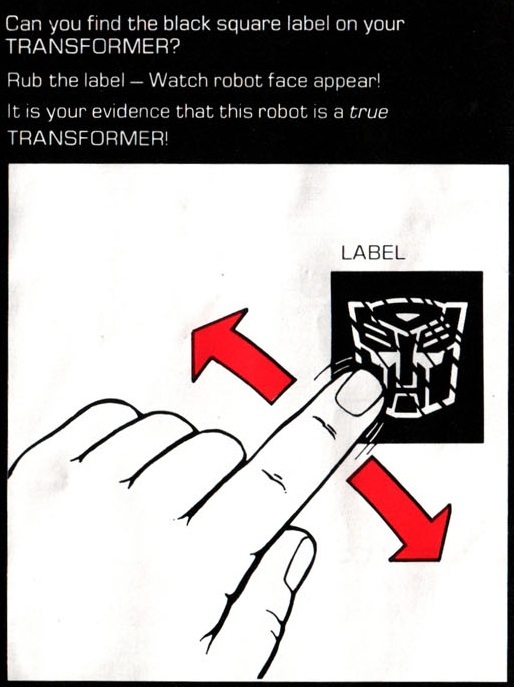 But wait, there are different faction logos; Autobot and Decepticon. That makes a total of 24 variations?!? What is a fanboy to do? Well I’m sure many a collector will happily track down all 24 variations, but for me this was too much. I’m not bothered at all about faction variations, as to me any cars from the first three years have to be Autobots, right? Twelve mini-spies isn’t untenable, but it is now a question of space and as cute as they are, do I need that many variations? But there is a real solution. 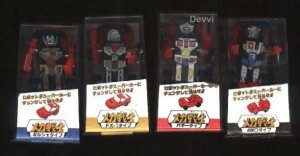 Contrary to popular belief, the Mini-Spies were not ported over from Diaclone or Micro-Change, yet they are Takara through and through, from another line called Mecha Senshi (Mecha Warriors), where they were packaged separately, and in great packaging too. 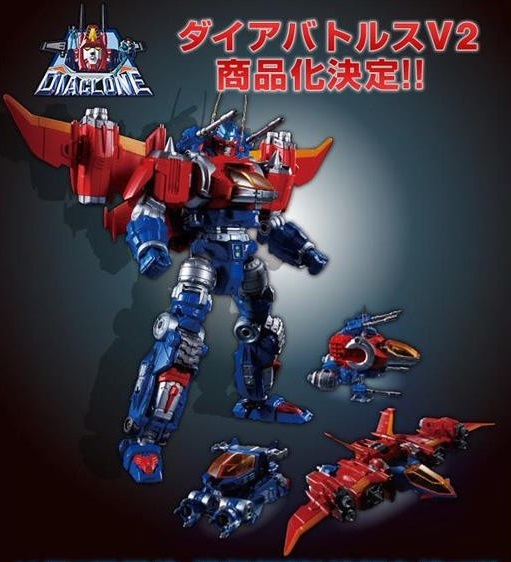 In Mecha Senshi, they were only available in two colours; blue, and red. Wait, did I say red? Suddenly, my collecting woes are over! 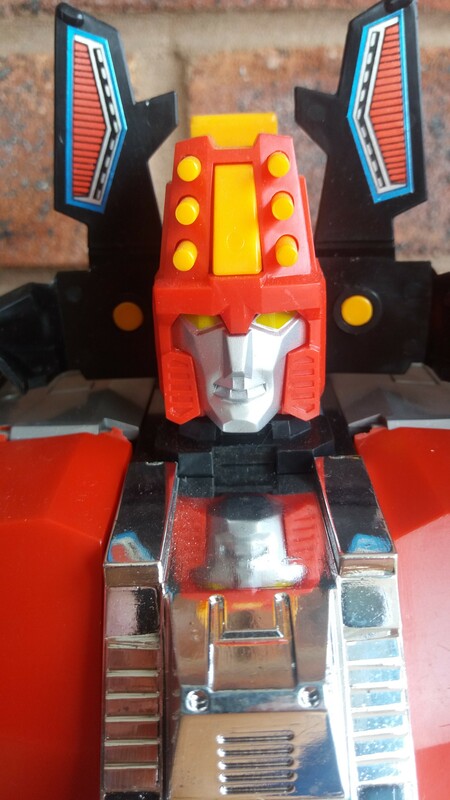 I only found out about the red Takara versions a few months ago after a chat with fellow toy enthusiast Flux Convoy, and made it one of my priorities for Botcon 2016. 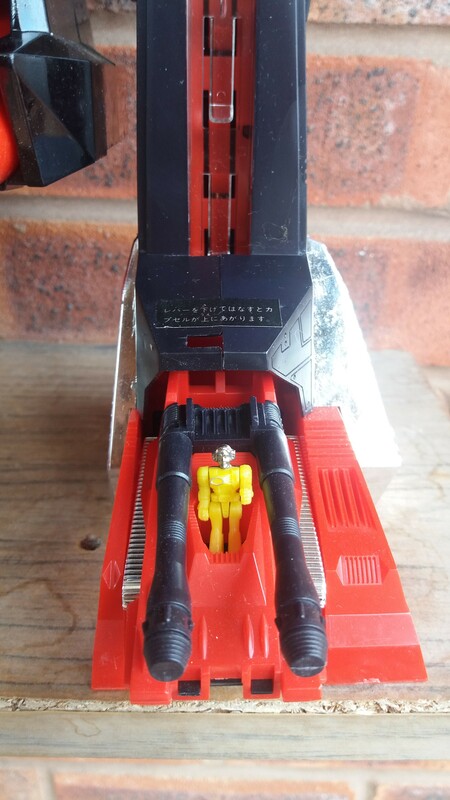 It’s not like they are particularly expensive, but even Hasbro minispies can be hard to find, never mind a pre-Transformers version in red. I found one which was a little expensive for my tastes, but I couldn’t resist the packaging. 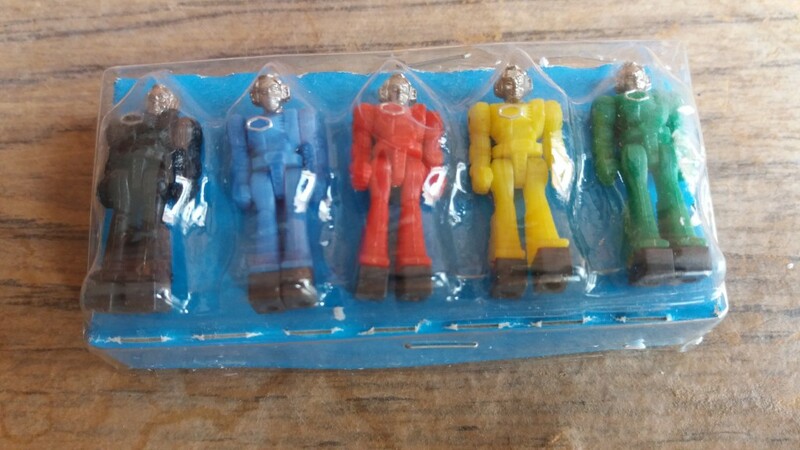 I’m trying to find out a bit more about the Mecha Senshi figures, like were they available to buy separately, or were they some kind of vending machine product, because the packaging almost looks more like a primitive gacha capsule. The current consensus seems to be store display, probably counter-top case displays. Any pictures or information would be gratefully received. The thing I appreciate most about the Takara version are the stickers, although they offer little to the mechanized and awesome pull-back-and-go car mode, the robot mode badly needs some extra detailing, and the numbering of each figure is a great touch. 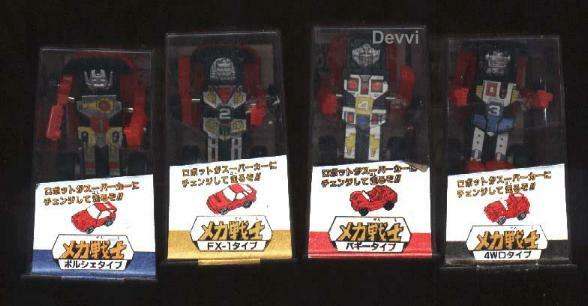 It make me want to seek out the other three in Takara versions, but then I’m limited to the two colours again. And if I’m not going to do that, should I put a rubsign on the red version to give them a uniform look? It seems a nerd’s work is never done. 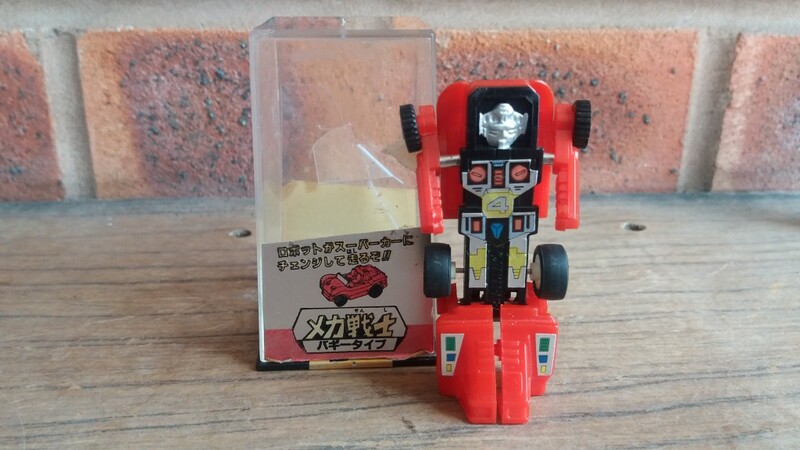 Rubsigns were phased out in 1988, most likely because the plethora of all new molds post-movie meant that distinguishing Transformers from previous incarnations of Takara product was no longer a concern. 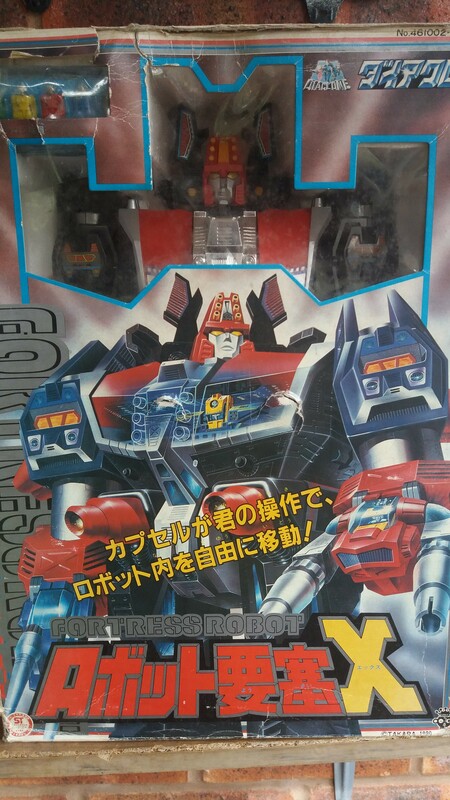 This meant that some of the combiners were available sans rubsigns for the first time with the gold-packaging re-releases of the early 90s. We wouldn’t see the return of rubsigns until Beast Wars year two, as Energon chips, and they finally returned to Transformers proper in 2006 for the Classics line, just as we always remembered them. Note the Toyota listed as a Mazda, a common mistake. 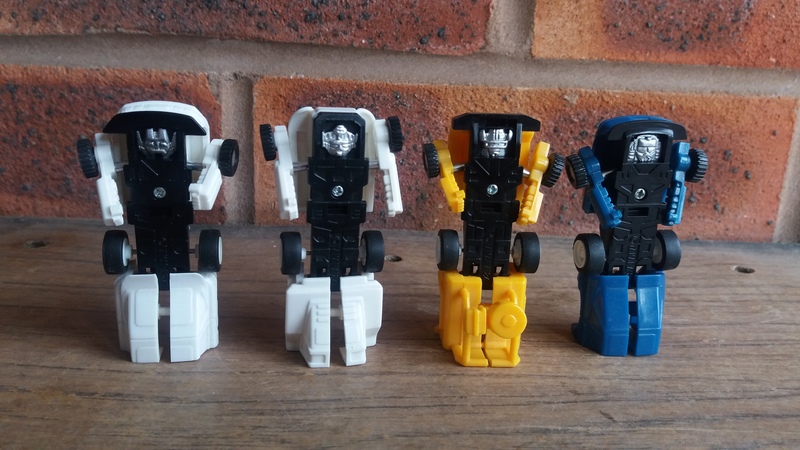 Most people who collected Transformers in the eighties will remember the rubsigns with fondness, I’m sure. Together with the red decoder strip for text specs, and the iconic packaging, these things all helped to cement Transformers into an entire generations psyche, but as fun as the gimmick was, even as a young ‘un I felt that in some circumstances the rubsign got in the way. 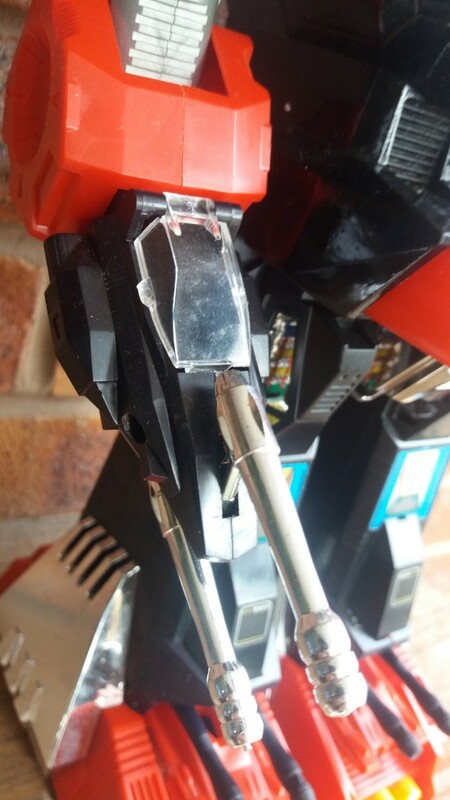 On top of Optimus Prime’s cab? No problem. 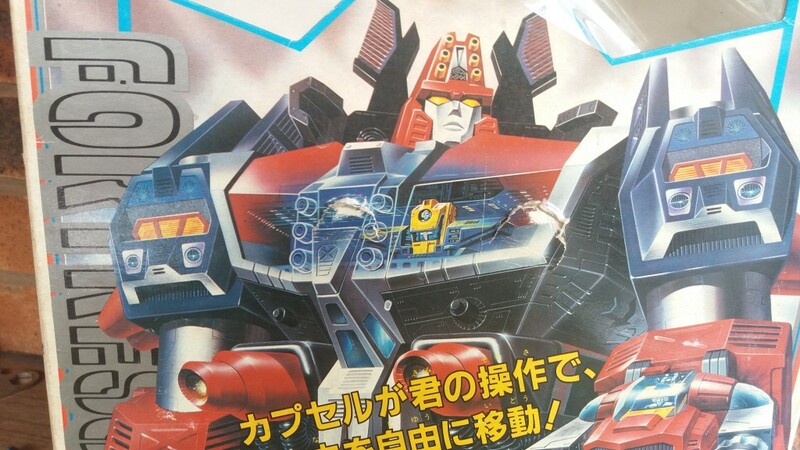 Front and center on Soundwave’s chest in lieu of a proper show accurate faction sticker? Problem. Other than the minispies, the idea of a transformers allegiance being a mystery until you checked the rubsign was never actually used to promote a toy or build mystique surrounding a characters loyalties, which I feel is a real missed opportunity. The closest we came was with Punch / Counterpunch, who had both an Autobot and a Decepticon logo. Even now, 30 years on, I think it would be very cool to introduce a character in the comic and his or her allegiance be kept a secret until the toy release, which reveals once and for all their true leanings. Although, I fear in the age of internet spoilers, this potentially cool idea would be blown before the toys even made it to the shelves. Arguably, the best use of the rubsigns was on the Battle Beasts toyline, with their wood, fire, and water powers (think rock / paper / scissors analogue) hidden in a rubsign on their chest. 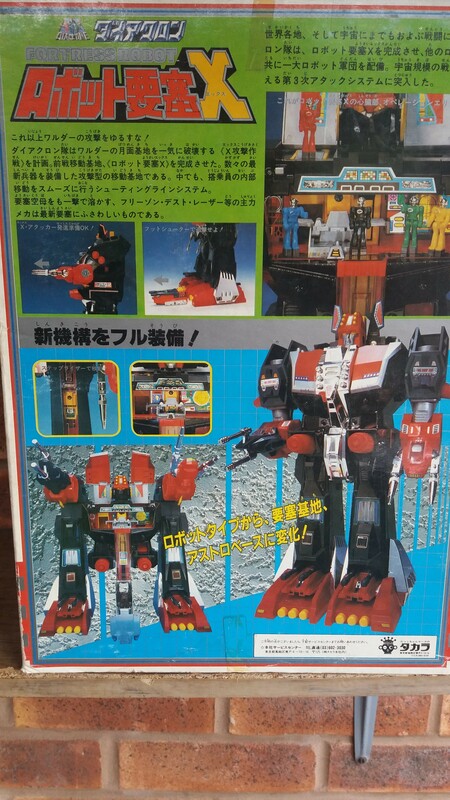 In Japan, this toyline was actually a part of the Transformers line, with the Beastformers first appearing in the Headmasters cartoon. Perhaps we’ll take a look at this range another day.